Mrs. Hargrove was my 10th grade homeroom teacher. She taught English and Latin She was a very good teacher. She inspired a high degree of integrity and achievement. I came to love her because she was so nice and encouraging. The Latin classes helped me tremendously in college and later in law school. It opened vistas of learning for me that I would not have had without Latin and Mrs. Hargrove's patient teaching. I remember specifically having her to review a speech that I prepared for the 1956 Athens Area Jaycee "Voice of America" contest. I placed 2nd in the Regional High School competition. Mrs. Hargrove accompanied me to the awards banquet at the Georgian Hotel in Athens. She was always encouraging and understanding. I valued her very much as a teacher and as a person and friend. I corresponded with her and visited her for years- through college, the Army, and later during my legal career. I served as a pallbearer at her funeral when she died in 1993. It was an honor and a deep personal loss for me. Countless Oconee County students were better prepared for college and life's challenges because of the untiring efforts and support of Kathryn D. Hargrove. 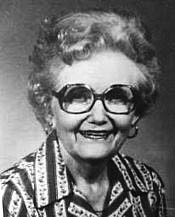 She taught at Watkinsville in the 40's & 50's and at OCHS on Mars Hill Road starting in 1956. She taught my daughter, Jennifer, Latin in the Eighties. She was a loving and sensitive person. I loved her. Wendell Dawson "OCHS Class of '58"
KATHRYN HARGROVE Died April 1, 1993, a resident of Clarke County, Georgia.